God decreed a special yearlong Jubilee every 50 years which was supposed to be a holy year. Land and houses were given back to their original owners. The land would lie fallow so that there was no laboring in the fields and it gave the land a year to replenish itself. The main idea behind the Year of Jubilee was redemption. The original owners were to return to their family property and their own clan. It had once been their inheritance so they were supposed to get it back. Slaves and bond servants were set free. Houses that weren’t in walled cities were given back. 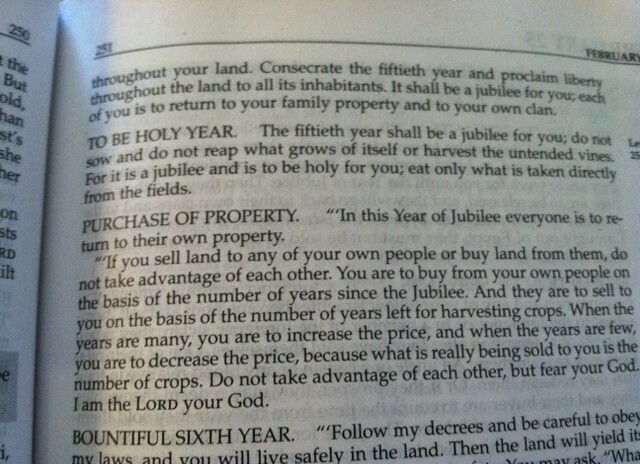 God told them they he owned all of the land anyway- they were just using it. So none of it should be permanently sold. When they showed concern about what they would eat if they didn’t plant and harvest, God told them he would take care of them by giving them a bountiful year the year before so that they had plenty for their holy year. All of this was a foretaste of the redemption that would happen when the Messiah came. There is no evidence that the year of Jubilee was ever celebrated. Are you surprised? After working hard and ‘earning’ the right to own what we have, how interested would we be in giving it back? It’s definitely not the democratic, free market way. But it’s God’s way. The Bible is one long story of his plan for our redemption. We can’t earn it. Jesus paid the price and we get it all for free. For eternity. Thank you, dear Father, for our redemption. We can never earn it. We’re so grateful that it’s free.